"You left home just as soon as you could." 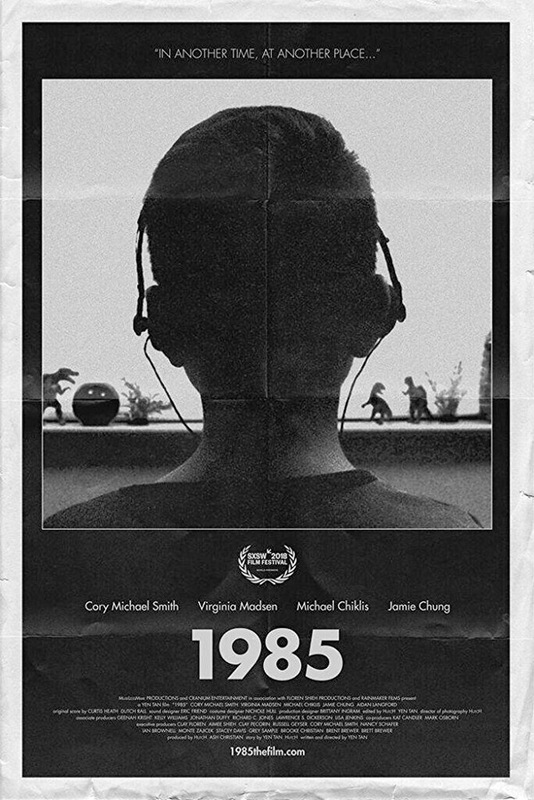 Wolfe Releasing has debuted an official trailer for an indie drama title 1985, the latest film made by Malaysian-American filmmaker Yen Tan. This premiered at the SXSW Film Festival and a number of other film festivals this year, so it definitely has some clout and acclaim. 1985 stars Cory Michael Smith (from Wonderstruck, "Gotham") as a closeted young man living in New York City in 1985, who heads home to his Texas hometown for Christmas during the first wave of the AIDS crisis. There he reconnects with his brother and friend, and attempts to have a real conversation with his religious parents. Starring Virginia Madsen & Michael Chiklis as his parents, along with Jamie Chung, Aidan Langford, and Bryan Massey. This was shot in high-contrast black-and-white on 16mm, which connects it even more with the setting and adds another layer of dramatic tension to the storytelling. Check this out. Inspired by the award-winning short film of the same name, 1985 follows Adrian (Cory Michael Smith), a closeted young man returning to his Texas hometown for Christmas during the first wave of the AIDS crisis. Burdened with an unspeakable tragedy in New York, Adrian reconnects with his brother (Aidan Langford) and estranged childhood friend Carly (Jamie Chung), as he struggles to divulge his dire circumstances to his religious parents (Virginia Madsen & Michael Chiklis). 1985 is directed by Malaysian-American filmmaker Yen Tan, an experienced graphic designer and director of the films Happy Birthday, Deadroom, Ciao, and Pit Stop previously, as well as numerous shorts. The screenplay is also written by Yen Tan, from a story by Hutch and Yen Tan. This first premiered at the SXSW Film Festival this year. Wolfe Releasing will release Yen Tan's 1985 in select theaters starting October 26th this fall. Who's interested?